Creating quality, stylish, and affordable functional pottery since 1998! Julia E. Dean is an amazing artist with beautiful pottery creations. Living among the beauty of natural in New York, Julia is able to take that nature and intuitively create this beautiful Robins Egg Blue Mug. Delicate in design, simple, yet beautiful. It fits into any decor that you already have. Easily works for coffee, tea or even soup! I love that I can surround my hands on this wider rim and sip my morning coffee. Wheel thrown, this mug holds about 12 ounces of heavenly drink. Dishwasher and microwave safe. It will get hotter if you microwave it so be careful when pulling it out. I prefer to just use it for hot coffee and hand wash for longevity. A piece or artistry like this needs to be well cared for! 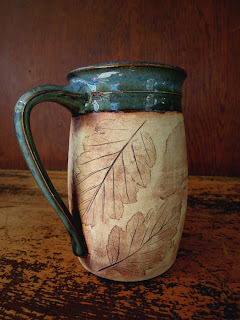 It is a toss up between this piece and Julia's Rustic Woodland Mug as to which is my all time favorite coffee mug. "The act of creating manifests a profound vulnerability within oneself. Drawing from life experience, visions, memories and emotion gives way to a resounding and poignant conversation with the deepest parts of one's soul. For me, listening well to this conversation gives space for the gestation and birth of images and forms that narrate my journey inward"
Julia is giving my readers one of her Robins Egg Blue mugs in the Winter Wonderland Giveaway Hop! Visit Julia's Etsy site and let me know which is your favorite art piece? I like the Rustic Woodland Mug!! I really like the nautical coffee mug! I love the Mug Shot! How fun!